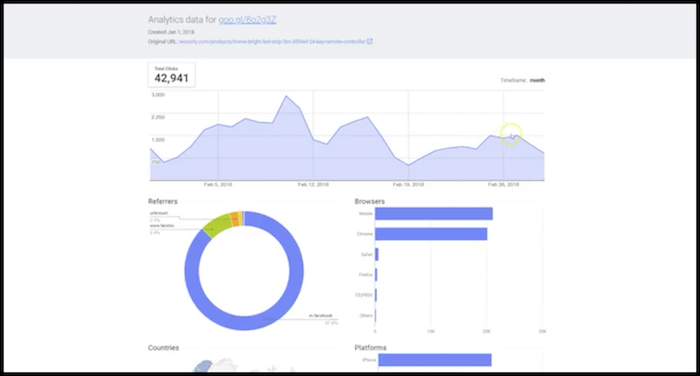 Today we’re revealing a unique resource to spy on your Facebook competitors. Popular search terms referring to dropshipping ads / products are getting shut down. Making it increasingly difficult to research the competition. The software we’re revealing today will bypass this issue. It will also reveal every aspect of real-time winning campaigns to give you an edge over your competition. Similar tools in the past were shut down for non-compliance with Facebook’s Terms of Service. 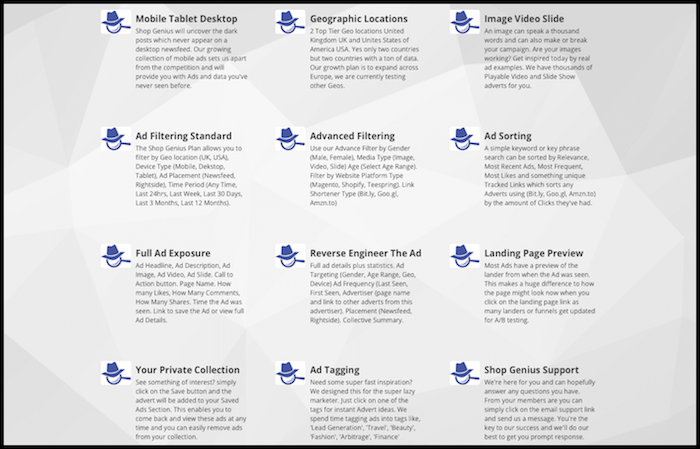 It’s A Facebook Ads Research Tool That Offers Real Time Spying Without The Worry Of Non-Compliance Typically Associated With Other Solutions! And Now You Can Try ShopGenius RISK FREE And Save $30 Dollars Per Month With Our Special Launch Offer. This is a Facebook Approved Solution for eCommerce businesses who need an edge. ShopGenius is much easier to use than other competitive research tools we’ve used in the past. When you incorporate this user-friendly software into your eCommerce business, you’ll immediately save time on market research and competitive spying, setting the stage for a successful Shopify store. But that’s just a small taste of what ShopGenius brings to the table. While competing products struggle to measure up when it comes to providing an all-around solution, ShopGenius has a top-shelf set of features guaranteed to help you tackle competitive spying at the source! These are our current favorites, but they’re certainly not the ONLY reason we suggest ShopGenius. 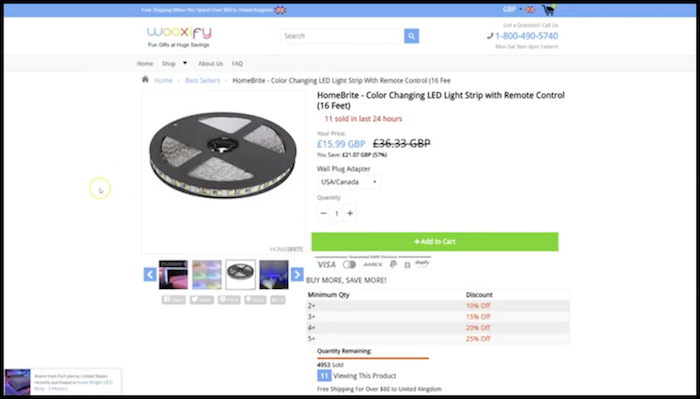 Simply filter by Website Type and Select Shopify. 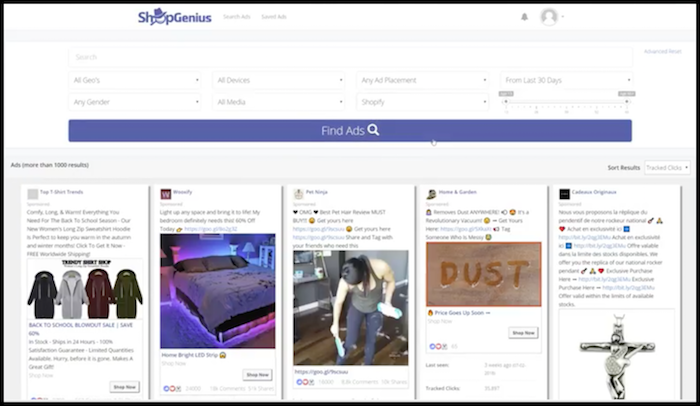 Since ShopGenius’ release, hundreds of businesses have already begun utilizing its spy technology and taking their competitive research to new heights. Easily identifying winning products and the businesses, landing pages and creatives used to sell them. And many of these same companies have experienced unprecedented success with their Facebook Ads and Winning Product Selection, thanks to this complete, automated system. Rito himself, has already begun to use ShopGenius for our ad sets and the results are obvious. The time it saves us on product and copywriting research alone is worth the investment. You’ll Earn Back Many Times Your Investment! If you were to continue on as you are now, winging your ads and never revealing what’s working right now and what’s now. It’s likely your business will fail and you’ll lost thousands of dollars. And more importantly, you’ll lose time. Time you could be using to scale winning Facebook Ads. … And all you invest today is just $129 $99 per month! And when you further consider that competing (but less robust) software solutions will easily cost hundreds or MORE per month, we’ll think you’ll agree you won’t find better value for your money! We want to make sure you get the MOST out of ShopGenius. We understand that purchasing software online can be an intimidating proposition, so we’d like to make claiming ShopGenius a risk-free proposition. Simply try it for the next 30 days, to see for yourself if it really can help you quickly and easily uncover the winning landing pages your competitors are sending traffic to. If you decide it doesn’t perform as we say — or if you simply feel it’s not for you — just let us know before the end of your trial period, and we’ll promptly send you a full refund of your entire investment. 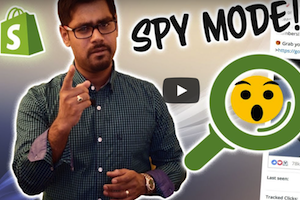 Start To Spy On Competitors And Scale Your Shopify Store In The Next Five Minutes! … The #1 rated software guaranteed to deliver EVERYTHING you need to Identify Winning Products and Create Converting Campaigns? Remember, NO other software can provide you with the same revealing insights and ease of use. And nobody else can offer you the same value for your dollar. Access your copy of this proprietary software in the next five minutes, and by this time tomorrow, you’ll be enjoying all of the benefits we’ve outlined above, including new winning products and highly effective ad campaigns. That’ll do it for Episode 32 – Great work! P.P.S. Click here for Bizathon6 Episode1! i havent found any product from shopgenius., i think i am not able to use it a proper way. How can you help me find a good product?